Automobiles are very different devices than they were 10 years ago. They no longer simply exist to get someone from point A to point B and instead have a myriad of other useful functions that keep people safe, keep the car running more efficient and keep passengers entertained. 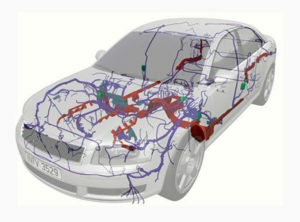 In order to achieve this the car of today has literally miles of wires and thousands of connectors to monitor and control the engine, brakes, fluids and safety devices. How does one ensure what is in the vehicle has been fully tested? Wire Harness and Hi-Pot testing equipment are designed specifically to detect cable problems. The GC2717 reed switch are designed into relays used in cable testers that check for open and short circuits and breakdown voltage isolation testing to find problems before vehicle installation. Safety and reliability when you turn the ignition key or cruise the internet every time.